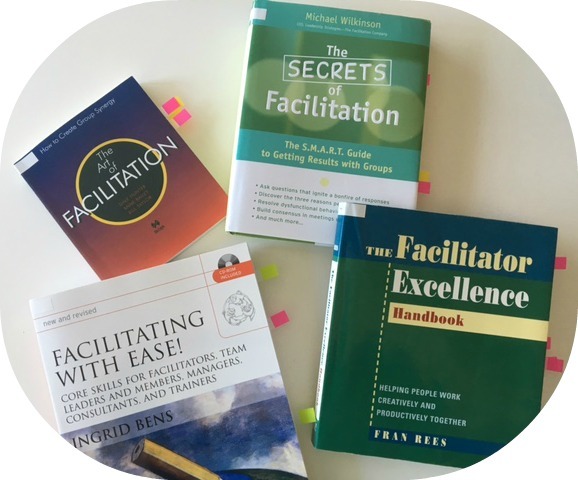 Often people struggle with best ways to describe what they do as a process facilitator or how to market facilitation as a service to both internal and external clients. Sorry, there are really no easy ways to synthesize the complexity of what you do in the typical elevator speech format. However, let me give you some tips from some of my own experiences and those of long time experienced facilitators I trust. 4) the How – your particular style and gifts that you would bring to the situation. 1. 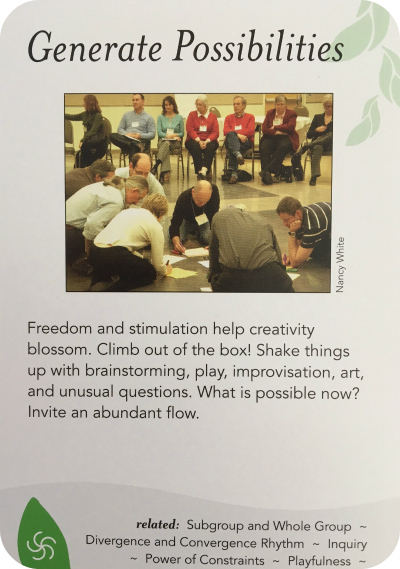 The What of Facilitation. Here’s what these four facilitator authors noted above typically include as their roles. • Helping the group assess their needs and create plans to address the needs. And much more…. You can choose which ones to emphasize to your client. 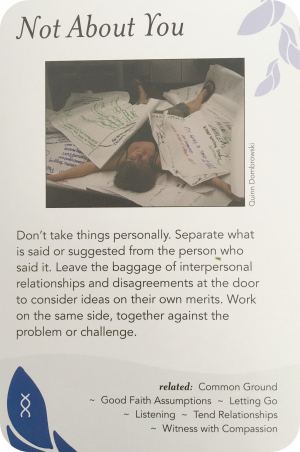 You might tell your client that facilitation can help overcome some of the inherent difficulties of working with groups. It will help people cooperate together. The skills that the facilitator brings will capitalize on the synergy of the group and gain support and buy-in for important efforts. It will capitalize on differences and diversity and work through factions and conflicts. People say that some of the other benefits include: motivation to support the decisions made, better results than individual efforts, maximum participation, develops leaders in the organization, increases flexibility of teams and organizations, speeds up decision making that has maximum buy-in, encourages people to think and act for the overall good of the team and organization, and reduces attitudes such as, “it’s not my job” or “just tell me what to do”. 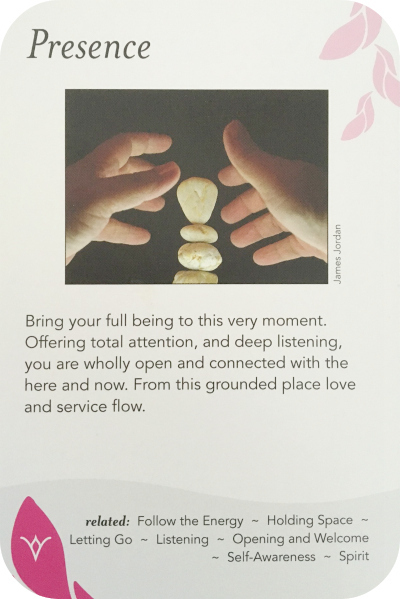 Each one of us has a particular gift and stance as a facilitator. This is the piece that can make a significant difference to whether you get chosen for the job or brought back if you have already worked with the group. People do choose you for style or stance! If you know what your gifts are and you can articulate how you will use them with the group, this can be to your advantage. Below I draw on photos of the Group Works card deck (http://groupworksdeck.org/) to share some examples of possible gifts you can offer for a particular project. The first three are ones you should always tell the client about. The last five are ones that might be unique to you or to the project for which you are being considered. And, they are definitely worth developing. I might say “don’t take failure or success personally”. Keep your equanimity (sense of peacefulness) no matter what happens. You do the best you can and then accept where the group and you end up. 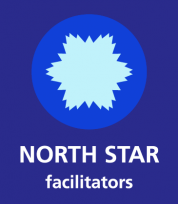 Another important aspect you bring to the group is what the facilitator profession calls neutrality. It doesn’t mean that you don’t care about a topic or don’t know about a topic, but it does mean that you won’t take sides, won’t over acknowledge some people, continually offer your opinions, or reject any idea no matter how different it might seem from your own perspective. If your client knows he/she can count on you for a very affirming, balanced perspective and acceptance of all ideas and people, they will trust you with their teams. 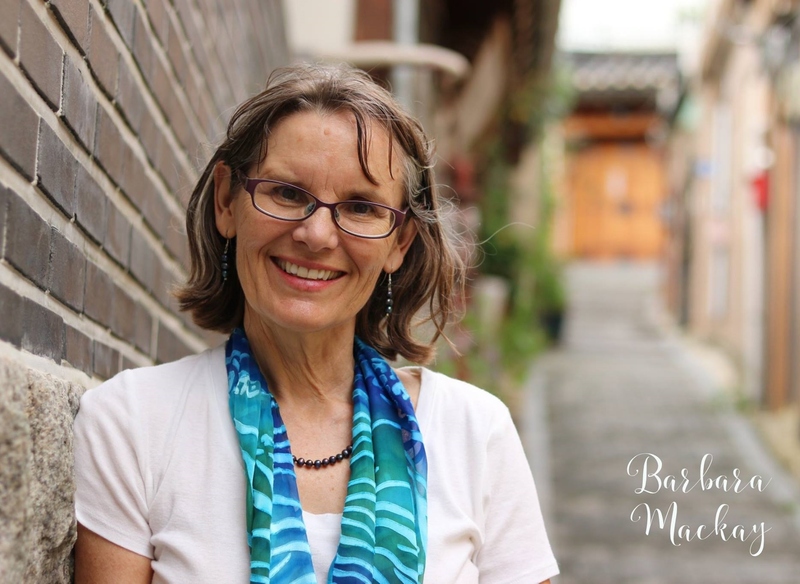 Your stance might also include being a steward (keeper/ guardian/ protector) of the process. 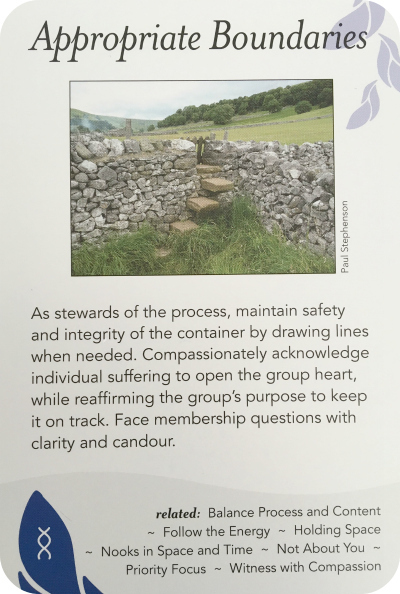 Somewhat related to equanimity and neutrality noted above, you are continually maintaining safety and integrity for the group. Although you might be drawn into a particular person’s dilemma or idea, you know how to stay focused on the most important purpose of the session and keep the group on track. The more your stance includes stewardship, the more the client will also trust you. 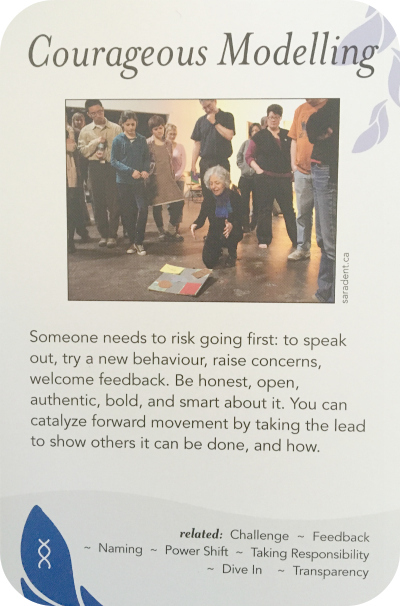 It is key as a facilitator to adopt a respectful style for every person in the room. 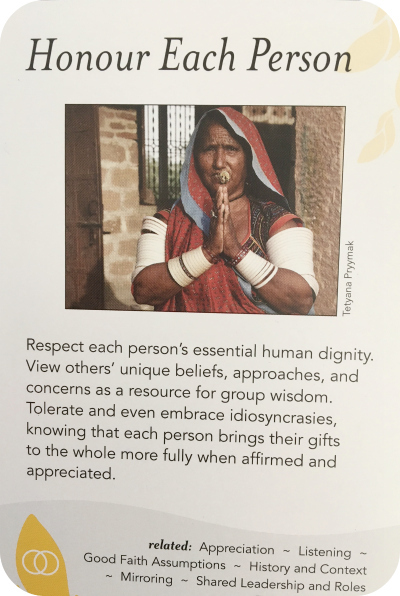 Your ability to appear tolerant and affirm unique beliefs and differences is also critical to the client and the participants wanting to continue working with you. Now we’re getting into stances or qualities that may not be important for every situation but if you happen to know you have these gifts, be sure to demonstrate them or articulate them to your client. You might be a really creative person and be willing to ask provocative questions, or get the group to do things they would NEVER agree to do if they were asked by someone else. The key to getting people to generate creativity and possibilities is to have confidence in their ability. Explain very clearly why a creative process is going to help them get to unusual and helpful answers to their problems. Imagination and Imagery: some groups will thrive by telling their stories. This is especially true in some cultural contexts. 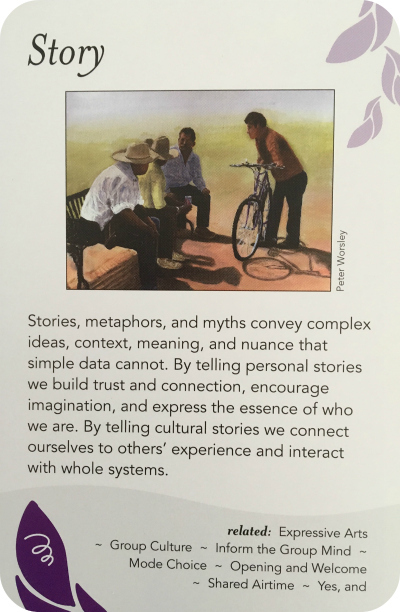 If you have the fit of drawing out people’s stories and helping people build trust and connection by doing that, tell your client about this gift. Story telling can be done in so many ways – watch for a future blog on this! 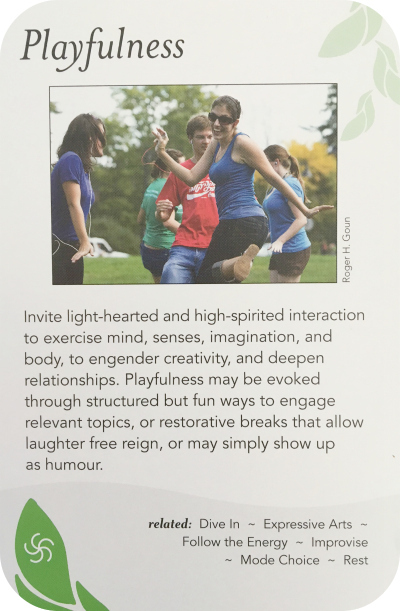 maybe you know how to draw out a group’s sense of fun and wonder. Maybe you are good at getting the group to laugh at themselves or the situation. This can be a real asset when the situation is tense or the group is feeling discouraged. Fun, done with the right balance of digging deep, you client might really appreciate Knowing about this as one of your qualities. you the facilitator need to be able to ask the right question in a neutral way that opens the door to people telling the truth. This takes courage, diplomacy and tact. If you can do this when the situation calls for it, let your client know that you are willing to do this if they are open to it. You might ask your client: do you need an outside person to ask the hard questions in a respectful way? I can do that. ah, this word brings joy to my ears. I am biased. I think your ability to stay present with the group and help them achieve presence can unlock many dilemmas. You model this for your client by staying calm, paying attention to their words and body language and being receptive and non-judging of everything that arises or is “thrown at you”!. Can you offer that to the client and the group? You might not need to say anything about this quality- they will pick it up with you are very present with them. Good luck with your next client encounter. 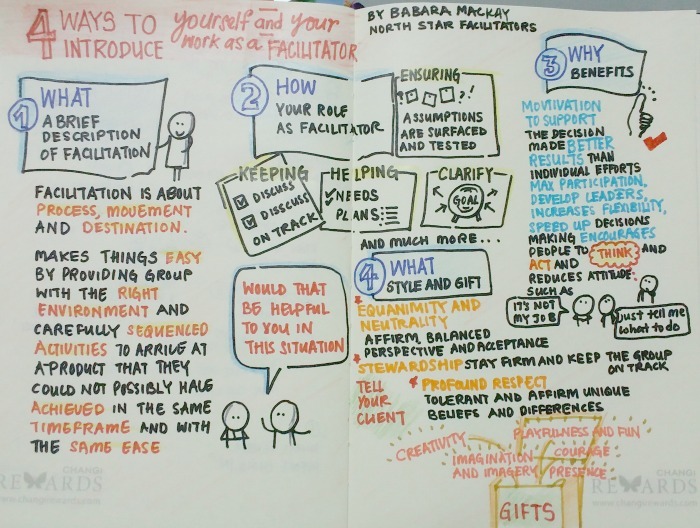 May you now have a few more things to tell them about facilitation and what you can bring to their group. Let me know how it goes please. Sign up here to download this simple guide to help you make your next introduction!